Oliver Brown-Hill scored for Stamford at Romulus. Stamford AFC’s dismal season in Division One South of the Evo Stik Northern Premier Division continued at Romulus last night (December 13). The Daniels were expected to challenge for promotion this season, but instead they languish in 18th place after two heavy away defeats in four days. Harry Limb (red) scored the Wisbech goal against Boston. It was 3-0 at Kidsgrove on Saturday (December 10) and 4-2 at Romulus last night. Graham Drury’s men conceded three goals in 11 minutes to fall 3-0 down after 26 minutes before performing much better after the break. 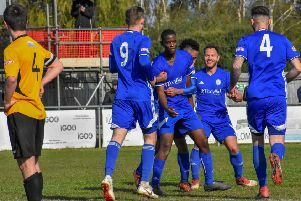 Oliver Brown-Hill pulled a goal back seven minutes after the re-start and Delroy Gordon grabbed a consolation goal eight minutes from time soon after the home side had grabbed a fourth goal. In-form Wisbech Town were denied a seventh straight win in all competitions by a last-gasp Boston Town goal in a United Counties Premier Division fixture at the Fenland Stadium last night. The match finished 1-1 which was still enough to move Wisbech up a place to ninth. Harry Limb had opened the scoring against the team who started the night next-to-bottom of the table just before the hour mark. Wisbech 1 (Limb), Boston Town 1.